The Ford F-150 delivers all the big-truck attributes of toughness, strength, and cargo capacity, but offers interior design and comfort that would rival some luxury cars. It's also stylish, among the best-looking in a group of handsome full-size pickups for the 2006 model year. Properly equipped, an F-150 can tow 9,900 pounds or haul more than 3,000 pounds in the bed. The F-150 is comfortable as well, with a quiet and refined ride and comfortable interiors that show attention to detail. Handling is excellent for a pickup. The F-150 earned a five-star safety rating from the government (NHTSA) in frontal crash testing and was named a "Best Pick" in offset-crash rating from the Insurance Institute for Highway Safety. F-150 comes equipped with dual frontal airbags designed to deploy according to the severity of the crash and who or what is occupying the seat. Seat belts, your first line of defense in any crash, are equipped with pre-tensioners and energy-management retractors. For all these reasons, the F-150 has been America's best-selling full-size pickup for 28 consecutive years. It's the most important, most profitable vehicle Ford makes. F-150 was last redesigned in 2004, when it earned numerous awards, including North American Truck of the Year. Ford has not significantly changed the F-150 since then except to expand the lineup every year with new trim levels, variations, and specialty models. For 2006, SuperCrew (crew cab) models will be available with a longer, 6.5-foot bed; as well as the standard 5.5-foot short bed. A limited-production Harley-Davidson edition, previously offered on Super Duty models, is now available as an F-150 SuperCab (extended cab). 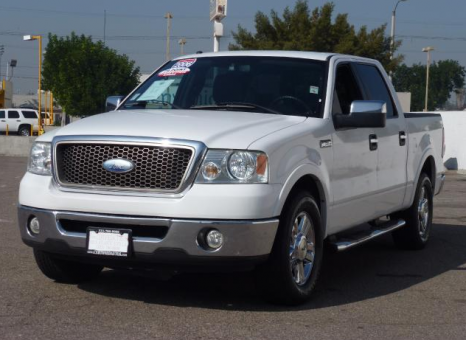 SuperCrew buyers can choose the King Ranch model, lavishly outfitted in Castano leather, one of our favorites. At the bottom of the lineup is a V6 work truck. F-150 offers more choices than any other pickup nameplate, with six distinct trim variations, the industry's widest variety of body configurations (three cab styles, three bed lengths, two bed styles), and a choice of V8 engines, all thoughtfully designed to address the distinct needs and wants of individual buyers.